Glazed, ceramic pot with attached saucer (small hole in bottom of pot allows drainage into saucer). 4" in diameter, 4 3/8" high. Suitable for standard violets and other plants (too large to properly grow miniature violets). Small rubber feet on saucer bottom to prevent scratching. Seller's (our) choice of color from what we have available. If you order with plants, ceramic items be shipped separately and will incur additional ($12) shipping costs! I ordered four of these and received 2 of one color and 2 of another. They were well packed and much prettier in person. 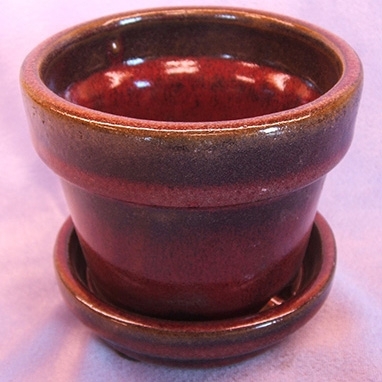 Great price and great pots! I love them!